Union County, Ohio, lives up to its name because it’s a union of four counties: Madison, Franklin, Delaware, and Logan. Marysville, Ohio, is its county seat, and the county has a population of over 52,000 residents. 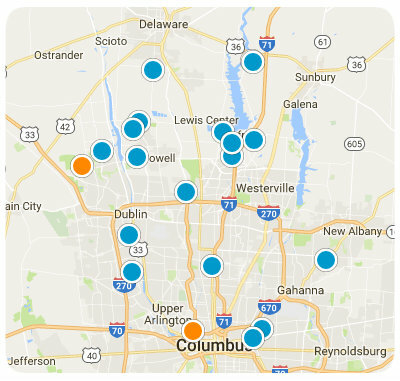 Union County is only 30 miles away from Downtown Columbus, and you can access it by going down United States Route 23. Homeowners love living in Union County, and it’s easy to see why. This county is abundant with activities related to history, art, culture, family and the outdoors. Mad River Mountain and Avalanche Tubing Park is where you can ski or ride tubes down a hill. If you’re a novice to skiing, that’s okay because the facility gives lessons, too. Drop by the Sean Doebert Amphitheater located in Marysville’s American Legion Park during the summer. The Concert in the Park series takes place there, so bring some blankets and companions to join in the musical fun. The Union County Historical Society Museum possesses a large collection of items that depict Union County’s history. Some of them include artifacts, flint, an old car and more. It’s available for tours every Wednesday from mid-May to mid-November. Invite your friends and family to join you at the Maize at Little Darby Creek. This attraction involves you going through a maze of maize. (Get it?) The maze is located on a 125-acre farm. The farm also offers berry-picking opportunities during summertime. Schwartzkopf Park in Marysville is a nice place to take the whole family out for fresh air. It has a fishing area, a playground, picnic shelters and a paved trail. Union County runs three public school districts and offers adult education services as well. The real estate properties in Union County are made up of single family residences that vary in style and price. These homes in Union County have an average of three to five bedrooms. Many homes here are two stories high and come with attached garages. Consider relocating yourself or your family to Union County. This county is a safe, gorgeous area with a healthy economy and a strong focus on families. If you want more information about homes for sale in Union County, Ohio, please contact us today. Listing Courtesy of : Pam Peters ---- OwnerLand Realty, Inc. Listing Courtesy of : Richard E Balch ---- RE/MAX Affiliates, Inc.